Maybe that’s what they’re going for, and that paint color is supposed to put us in mind of butter. OK, we’re going to say from the outset that the whole idea of a concept car like this is to look at least a bit outrageous and to get people talking. 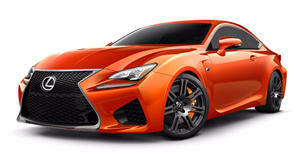 So we’re not going to come down too hard on the Lexus LF-C2 and its clearly very polarizing looks. At least, not any more than we already did in the headline. After all, a car with no roof whatsoever (that’s right, this is not a convertible) is pretty obviously not going to be a company like Lexus’s next project. But will a toned-down version make its way into production, perhaps with a folding metal roof? We wouldn't bet against it. Styling highlights of the 2+2 roadster that will invariably carry over to future models include a spindle grille with a unique “braided mesh theme,” aerodynamic mirrors, a quad exhaust, 20-inch five-spoke alloys and LED headlights. Step inside, and there's a cabin aping that of the RC Coupe with a full-length center console, new touchscreen controls and two-tone leather upholstery.